In many cases MINI takes steps to help hide the true soul of a turbo. The boost tubing is no exception. MINI engineers attempted to remove some turbo and boost noise by placing, of all things, a muffler in the boost tubing. In the same fashion as an exhaust muffler is restrictive to performance, so is this! ALTA product designers created a simple, attractive way to remove this muffler and increase performance. 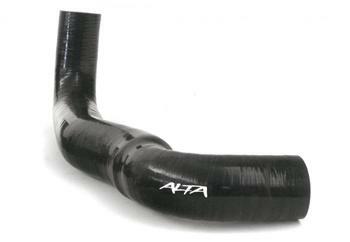 The ALTA Turbo Hot Side Boost Tube replaces the restrictive plastic and rubber OEM piece with a 5-ply silicone, fiber reinforced tube. With a mirror smooth interior surface, larger diameter and tapered transitions, you get a dramatic decrease in restriction and turbulence. By removing the muffler you get a nice mellow tone to the turbo and a leap forward in power. The silicone hose is restriction free with its smooth surfaces and larger internal volume. With the features listed above you get much better boost response and more horsepower! Check out the DYNO CHARTS tab above to see the 10 WHP and10 Ft-Lbs Torque.